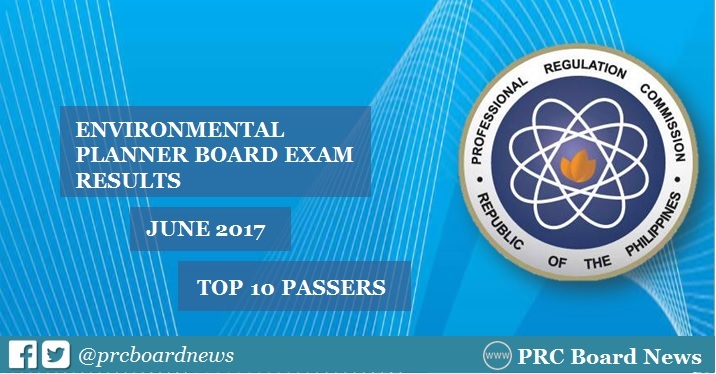 MANILA, Philippines - The Professional Regulation Commission (PRC) released the official list of topnotchers or top 5 passers in the June 2017 Environmental Planner board exam. Justin Victor Nisperos dela Cruz from Ateneo de Manila Univesity (ADMU) - QC topped the board with 82.30%. It was followed by Mary Jane Mendoza Rabang, graduate of University of the Philippines (UP) - Diliman, 81.70%. Here's a quick overview of previous examinations for Environmental Planner board exam. In the same period last year, Kim Robert Cuevas de Leon from University of the Philippines (UP) - Diliman topped the board with 83.50. It was folllowed by Maria Teresa Salas Alambra, also from UPD, who got 82.60%. In June 2015, Cid Leandro Miranda Jacob from Ateneo de Manila QC garnered the highest spot, 80.05%.